Korri's mother appeared. She gently touched Korri on the arm. "Dear, I'd like you to take a break. Make sure you have your homework done." "You and this nice gentleman have had a wonderful chat, but you have important things to do." With a shrug, Korri stood up and bowed. "An honor to meet you, sir." Her mother came around to where Karl sat. "You work for the school, yes? The publicity department?" "I see. I hope that Korri did not distract you from your task." "Then, may I propose something?" She took the notebook from Karl's hand. "You might find this more useful," she said as she began writing. Her text was in English, in a beautiful, easy to read longhand. "Korri is now 18. She was born in Osaka. She has trained since the age of 10 in rhythmic gymnastics, the last four years at the Club Royal Academy. Their staff has worked with the coaches at Rosebury to mold Korri into the world class athlete she is today. When she is not training, she enjoys music, the arts, and camaraderie with her friends. She hopes to teach someday in her native land." She handed back the notebook. Karl noted the large X through the rest of his text. "My dear young man, I have sat through dozens of meets and read countless little blurbs like this. Nobody mentions politics, conflict, or family drama. They simply want to distinguish girl one from girl two." "Was a fine man. The smartest man I have ever know. Also, the loveliest." "Noriyuki made only two mistakes that I know of. One was buying a motorcycle for himself when he turned fifty. The other was ever using it. It claimed his life one cold rainy night." "But he was smart enough to have planned our future before that night. All this is paid for. The settlement and the merger made his estate wealthy. We can pay for Korri's dream to travel, as well as support my son Ken's dreams when they run short on funds.."
"And your son, does the sensei..."
Korri's mother laughed. "The so-called sensei was a gym teacher, nothing more. She quit, we got another one." "Fixed his mistakes the way he always does, by leaving." "We have known Doctor Banerjee for many years. He would not tell the whole world that he developed a baby through genetic engineering if it wasn't true. And if I were you, I'd take the word of a man of science over people who talk of air elementals and spirit martial arts." "You can ask Takeo yourself. We hired his employee as a coach. When she started spouting mumbo jumbo, and our own daughter took it seriously, we cut it off." Before Karl realized it, she had stood him up, and they were walking towards the door. She stopped him before he left. "My friend, my daughter has worked hard to get where she is. Do not ruin her stay by making her look like a fool." Karl felt as if he was being disciplined by his own mother. Karl knew that his article was pretty much written. Korri's mother was right - this was a fluff piece. But his journalistic curiosity was getting the better of him. The Club Royal entrance was inside a secured building. Karl waited nervously for an employee or a patron to leave. Finally, a woman in a leotard approached. 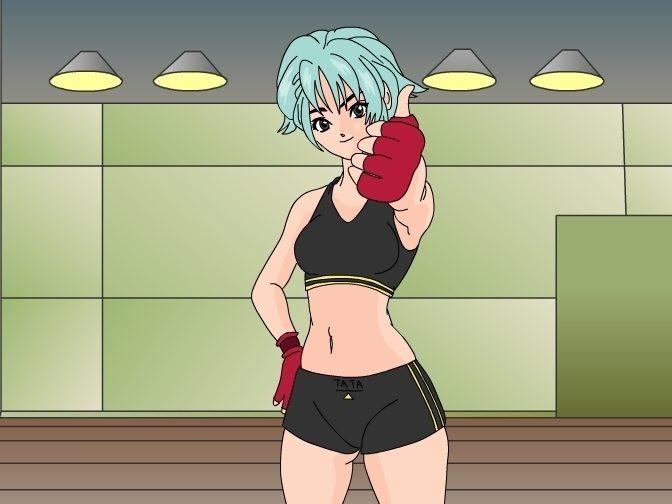 Her light blue hair was distinctive, as was her outgoing personality. "Club policy is in or out, mister!" "I was hoping to talk to Karen?" "You found me. What about?" "I'm doing an article on her. Is her old coach around, too?" "She's no longer with us. Try across the street." Karl turned to look behind him, and saw an eating establishment of some sort. He turned back to ask Karen about Korri, but she had already disappeared. He walked across the busy street and was instantly struck by the smell of spilled beer. He entered the establishment. Two men talked on either side of the bar; he assumed one was the bartender. In the other corner, a woman with fire-orange hair bent over a jukebox. As the music came on, she picked up a table napkin, and began dancing. The moves were not random, but where slow and deliberate. It didn't take Karl long to realize he had seen the dance before. But it had been done, by Korri, in competition. He drew a breath and approached her. She stopped, and put on a customer service style smile. "May I help you? I can get you a table, or maybe something else much nicer." She was flirting. But that was not why he was here. She threw the napkin to the ground. She looked wounded. Tears welled up as she turned and ran toward the rest room. Behind the bar, the bartender came around. He shot Karl a dirty look, then called out as he ran. SimMan Thanks for coming up with a nice little story for Korri. Now I know why they say women are multi-tasking.